← University Archivist Laura Uglean Jackson Stirs up Some School Spirit for Homecoming! 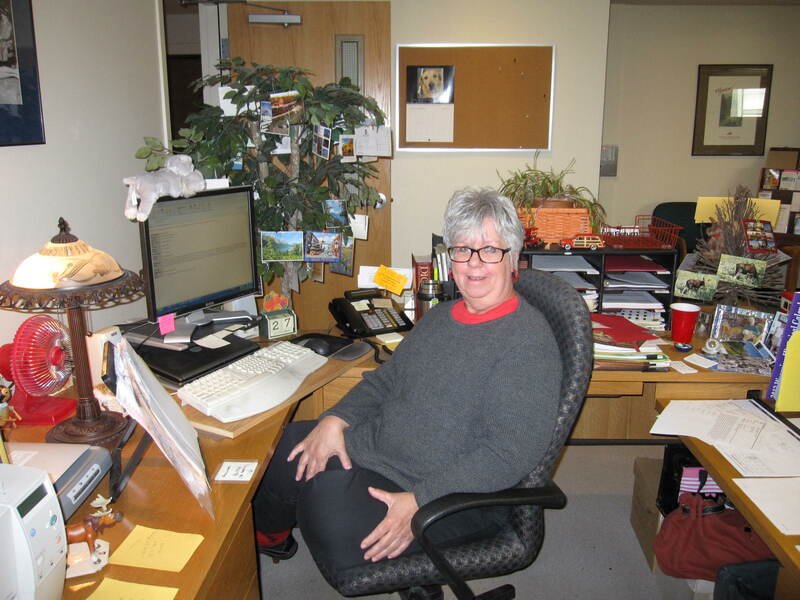 A “Day” in the Life: Vicki Schuster, Multi-Tasker Extraordinaire! 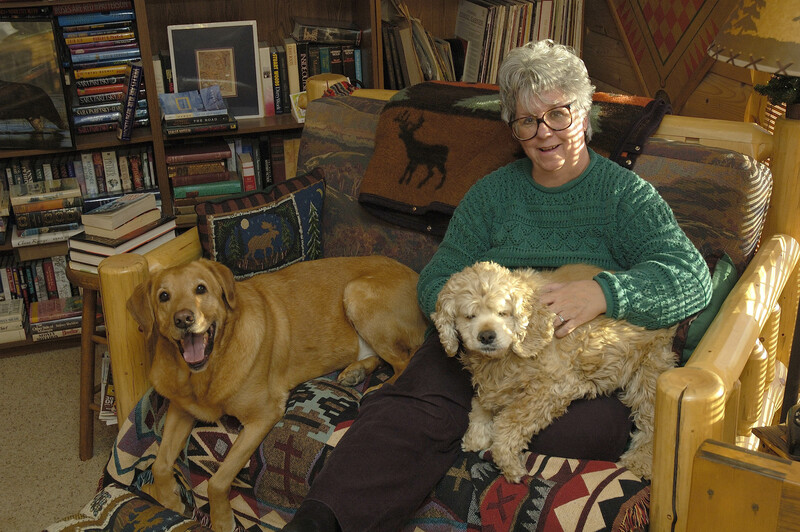 Vicki Schuster with her dogs Happy and Molly, in her home library. Clerical Support: I am an administrative assistant to Mark and Rick (our director and associate director), and help support the 50-plus faculty and staff with clerical help as needed. I use the Microsoft Suite of computer programs to generate correspondence, spreadsheets, and a variety of forms as needed. I also help co-ordinate donor mailings—from working with the UW Foundation in sending out several thousand letters or coordinating by myself smaller mailings of a few hundred in-house. I work with the UW Foundation in maintaining our current mail list. Occasionally, I’m called upon to help with the incoming and outgoing AHC mail. Graphic Design: I design all of our AHC publications—brochures, posters, flyers, advertising, newsletters, notecards, AHC annual Christmas card, and annual report. I also help design slideshows as necessary for a variety of our faculty and staff—my work with PowerPoint has been seen all over the world! Event Coordinator: I coordinate events held here at the AHC, as well as off-site. Off-site events include but are not limited to the spring meeting of AHC’s Board of Advisors; those meetings are held in various towns throughout Wyoming, and I assist with everything from designing and compiling the Board packets to working with hotels and caterers. I work in-house with our staff for AHC-hosted events such as lectures and authors’ readings and the classes taught by Rick Ewig and Anne Marie Lane. I also work with other UW teaching faculty and various outside groups wishing to use our facility for their classes, meetings, lectures, and gatherings. This involves maintaining the Centennial Complex Calendar to ensure rooms are available; that the rooms are set up for events and cleaned up after events; and sometimes setting up food and beverages or making necessary arrangements with catering companies. I have monthly meetings with Building Security, Custodial Staff, Art Museum staff, and myself to coordinate events in our building. Web Support: I assist the AHC Web master in maintaining our Web site. Receptionist: I help with reception duties and questions, as needed. When our Information Desk was staffed I worked some shifts, greeting patrons and answering questions as necessary. Now that we have switched over to an automatic phone system some calls are diverted to me and I remain acting in a receptionist capacity for Mark and Rick. Whatever: Basically, whatever is needed, I’m available to help! Vicki at her desk in the middle of a busy workday. When I moved to Laramie 13 years ago, one of the first places that drew my attention to visit was the Centennial Complex on the UW campus, housing the UW Art Museum and the UW American Heritage Center. Having no previous knowledge of the AHC, as an archives facility, my curiosity was aroused and then I was amazed upon my first visit, to find out about the vast variety of collections housed here. A couple of objects on display in the AHC that made my heart pound with excitement was being able to view the saddles of Hopalong Cassidy and the Cisco Kid (childhood heroes of mine!). When I visited with the AHC Information Desk person, she informed me what exactly the AHC was all about. Shortly after this visit, I was looking for a job and with utter and complete pleasure I saw an opening for an administrative assistant at the AHC. I applied for the job, with EVERYTHING crossed that could, in hopes that I would be hired. I got the job and I continue to be amazed to find out about something new (to me) in our vast collections—always interesting and intriguing. I am proud to work at the AHC where a part of our nation’s (and the world’s) history is meticulously preserved and greatly valued by the faculty and staff who work here. It’s definitely a place where the public and researchers are welcome to visit and freely share the treasure trove of information and artifacts!